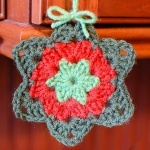 Home » Patterns » [FREE Pattern] This Fabulous Granny Square Christmas Tree Is Perfect for Decorating! It’s so creative and it will get you in that holiday mood quickly! This wonderful crochet Christmas tree is constructed with granny squares and yes, even if you’re relatively new to crocheting, this is an achievable project that you’ll find deeply satisfying. It’s perfect for when you want to get a jumpstart on holiday crocheting, whether it be that second holiday season known as Christmas in July or early in the fall. It makes for a great gift, too! 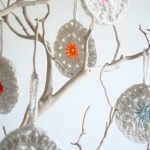 And if you sell your crochet creations at holiday crafts fairs and online consider this one as part of your inventory. This fabulous and creative pattern is free! It’s by designer Cheryl of Crochet 365 Knit Too. You’ll find the complete written pattern and everything you need to guide you to success from start to finish. And for even more fabulous and totally free Christmas holiday crochet patterns, be sure to check out some of our other posts here at Crochet Maze!